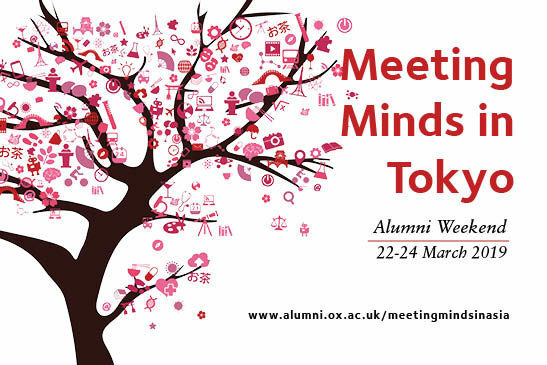 Oxford will be coming to Japan in March 2019 for a major event for alumni. Some of the University’s outstanding academics will be giving talks on a variety of topical issues at the Meeting Minds conference, and there will be a gala dinner and other social events throughout the weekend. Every year the University of Oxford holds a popular Alumni Weekend in Oxford inviting Oxonians back to the university to hear about our latest research and thinking. This event will be coming to Tokyo for the first time in 2019 offering a chance to hear from the Chancellor, Vice-Chancellor, some of Oxford’s top academics and some very special Japan-based speakers. The event will start on Friday 22 March with optional tours during the day and College Dinners in the evening. There will be a full academic programme on Saturday 23 March with a line-up of excellent speakers, and this will be followed in the evening by a celebration dinner at Happo-en. There will be more optional tours on Sunday 24 March and a floating brunch cruise around Tokyo Bay. Please see the Meeting Minds in Tokyo website for more details and the full programme. Bookings for this event are now open. Sakaguchi International Scholarship Foundation has launched a new scholarship for Japanese students taking a DPhil in the University of Oxford.